← Mam Tor and the Great Ridge. Cartmel is situated 2 miles north of Grange –over –Sands in Cumbria and horse racing takes place here several times a year. 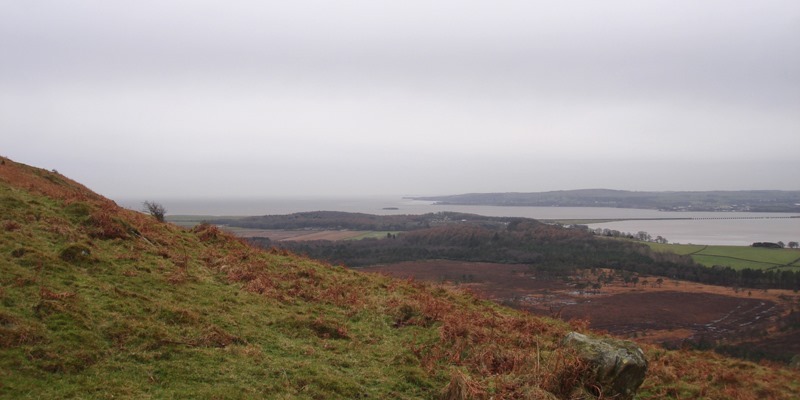 Cartmel’s religious history dates back to 677 when King Egfrith of Northumbria gave the village to St Cuthbert. The Priory or Church of St Mary and St Michael dates from the 12th century and is a place of pilgrimage. The village itself is very interesting, particularly the village square where some of the buildings are from the 16th and 17th century. 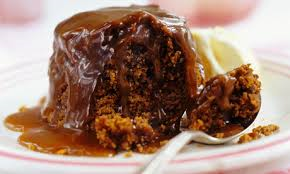 It is also the home of Sticky Toffee Pudding which has been made at the Cartmel Village shop for nearly 30 years. It is a famous English dessert consisting of moist sponge mixed with chopped dates and covered in a toffee sauce. It is often served with vanilla custard. However I was not here for the food. 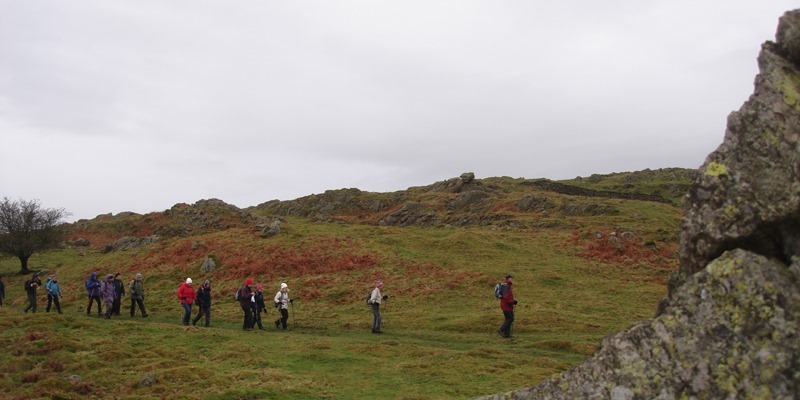 I was out with Crosby Rambling Club www.crosbyramblingclub.co.uk to do a low level walk. The weather forecast was not promising so I decided to do the relatively easy ‘B’ party walk of 8 miles. 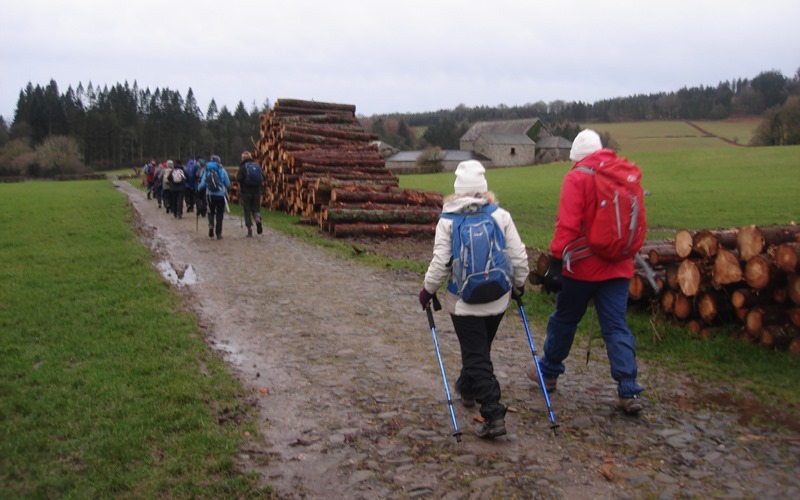 We set off across the racecourse heading south – west to join the Cumbria Way and then the Cumbria Coastal Way to climb up through woodland to Ellerside. We climbed up onto Ellerside ridge where we stopped for lunch in the shelter of some rocks. 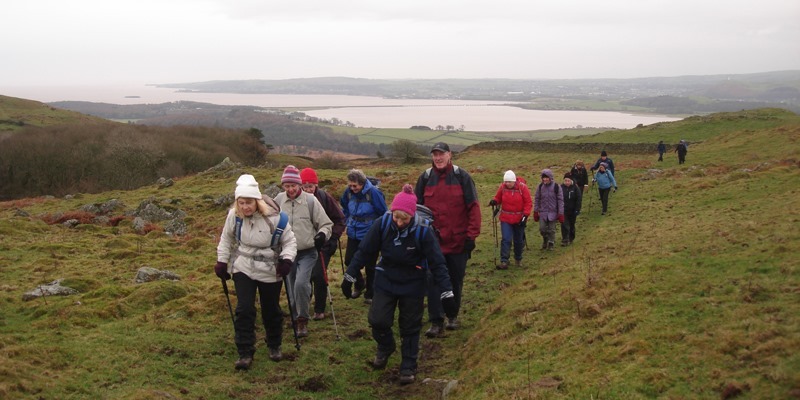 Although only just over 500 ft in height there were good views across Morecambe Bay and down to the estuary where the Kent Viaduct runs across to Arnside. 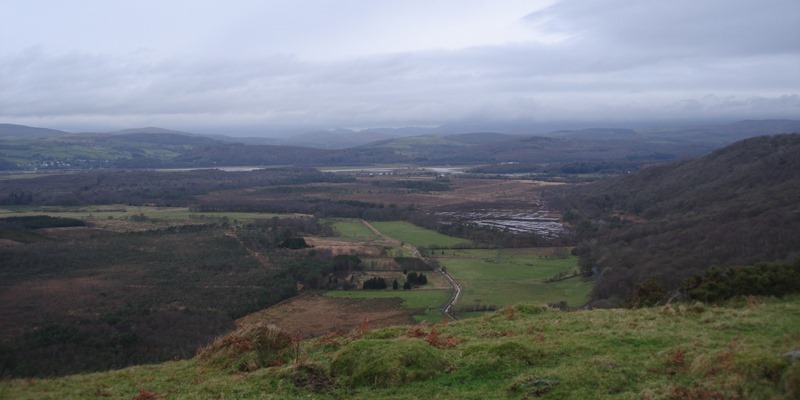 We followed the rocky ridge that runs south – north an dropped down to Grassgarth. It had now started to rain and it was getting very windy. We now had to make a decision. Do we climb up to Bigland Heights for the view or continue along the minor road. There would be no view so we stayed low. Our intended return route was across The Great Allotment but this woodland area has been largely felled and replanted. It all looks rather desolate and after the recent wet weather now resembled a quagmire. Our leader, Ray, plotted an alternative course bypassing several farms. Even so we had to make a couple of diversions as the area was flooded. At one point we became ‘begorsed’. Is that a word? We were surrounded by gorse with no clear path to follow. Eventually we descended through woodland and through the gloom we could see the lights of our coach in the car park across the race course. Half an hour later we had changed out of our wet and muddy clothes and had an hour to spare to enjoy the delights of Cartmel. The choice was a pot of tea and some sticky toffee pudding in the cafe or a pint of beer in the Kings Arms. I joined some of the ‘A ‘party group for a pint of Hawkshead bitter. Although only 3.7% abv, this pale, hoppy bitter is a perfect thirst quencher at the end of a walk even if you have been cold and wet. This entry was posted in Cumbria, Sunday Walks. Bookmark the permalink.